Los Angeles Creek Freak headed west today for an all-bloggers lunch with Siel (Green L.A. Girl) and Damien (L.A. StreetsBlog.) I took the opportunity to go and visit the city of Santa Monica’s new green street project. Creek Freak mentioned this project briefly in an earlier entry, referring readers to Heal the Bay’s Mark Gold’s account of the street’s opening festivities. There’s also coverage of its July 14th 2009 opening at L.A. Frog, LAist, the Santa Monica Mirror, and video footage posted by Global Green. The project was funded by state water bond Proposition 50, the state Water Resources Control Board, the local Regional Water Quality Control Board, the Santa Monica Bay Restoration Commission, and the city’s water quality parcel tax Measure V.
The overall design is pretty smart! It’s reminiscent of some simpler curb-cut water harvesting tree wells (click link for excellent photo worth easily a thousand words) that Brad Lancaster has done in Tucson. The concept is the same: street runoff in the gutter flows into the parkway (landscaped area between the sidewalk and the curb) and soaks into the ground there, watering trees and other plants. In large storms, excess water overflows back into the gutter. I actually prefer Lancaster’s design, which is simpler and perhaps more elegant; it merely subtracts some concrete, and utilizes the same gap for inflow and outflow of water. The Santa Monica green street is a little more engineered. It has rainwater flowing in a gap inlet, then through a depressed area (a swale), and then any excess that hasn’t soaked in will flow out a second opening (outlet) at the downstream end. There are many reasons that is all really really good. (Regular readers who have already read L.A. Creek Freak’s multi-benefit watershed management tirade can skip ahead to the next paragraph.) Our local waterways have big problems with pollution (water quality) and flooding (water quantity.) Additionally, we don’t have enough local water (water supply) so we import plenty of it at great monetary and environmental cost. We’ve designed most of our urbanized basin to usher rainwater out to the ocean as quickly as possible. Rain hits a roof, heads down a pipe onto a concrete driveway into a concrete gutter, into a concrete pipe (a storm drain,) into a concrete-lined creek, and into the ocean. We flush that rainwater out as fast as possible, in order to prevent flooding. Another approach, which this street represents, is to (in the words of Brad Lancaster) treat rainwater as a welcome guest: invite her to not be in such a hurry, to slow down and hang out with us for a while. When we slow rainwater down, pollutants it’s carrying settle out. When it runs across earth, the water soaks in and micro-organisms break down the pollutants. This results in cleaner water, less severe peak flooding, and more water stored underground… not to mention greener neighborhoods, more habitat, less air pollution, and lots more good stuff. Water in the gutter flows in this inlet. The inlet is a gap in the curb that has been covered with a metal lid forming a little tunnel. From there the water flows through the parkway in what we creek freaks call a “bio-swale.” It’s basically a mini-creekbed – a depressed, landscaped area between the sidewalk and the curb. The inlet above is shown at the bottom of this photo. The water flows in there and upward (photo-wise) toward the outlet in the upper right. Much of the water that enters the parkway soaks into the ground. In a large storm, water will reach the end of the bio-swale and will overflow back out into the gutter. In addition to the curbside bio-swales, the parking lane has been paved with porous (or permeable) concrete. In the above photo, the regular black asphalt shows on the right, and the porous pavement beneath the car is slightly lighter in color. In working with the city of Los Angeles on a shared street project in my neighborhood, neighbors pushed for permeable pavement in our street, but the city hadn’t used permeable pavement enough to be familiar with it. They expressed concern that it wouldn’t be strong enough to support the weight of large vehicles, so they only used it for the sidewalk on our street project. Santa Monica has used conventional asphalt for the center of the road, which needs to bear the most weight, and has put the porous pavement in the parking lane, which bears less weight. There are signs at each end that explain how and why the street does what it does. Oddly, they’re posted so high that even our 6’3″ tall L.A. Creek Freak correspondent had a hard time viewing and reading them. 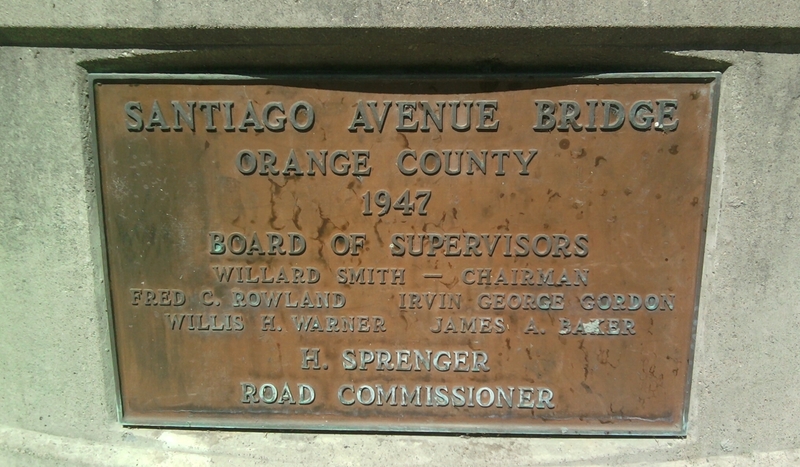 For a little more detail, there’s a decent almost-readable photo of one of these signs posted online by L.A. Frog. Perhaps the city of Santa Monica could lower these? and perhaps post one of them online somewhere? Before I launch into some critique, I want to emphasize that this is an excellent project! Yaaaayyyy! It should serve as a prototype for how streets should work all over. I really like that it’s actually pretty “readable” – one can look around the site and fairly easily understand how rainwater flows through it. I think it’s very important that we reveal water flows, so that the public can better understand and value our natural water cycles. Perhaps the project designers could explain what additional functionality (capacity? functionality?) these features contribute. They perhaps add some additional capacity for those once-in-a-lifetime hurricane-force storms. Even if this is true, they appear to be unneeded extra expenses. I suspect that they may make the project more prone to high tech failure… How long do you think it will it take for someone to step on and break those green plastic filter hood thingies? For my preference, I think that it’s better for us to trust nature to do the cleaning here. Nature does a great job on day one, and only gets better more effective as time progresses. This extra gray filter technology works as well as it ever will on day one and gets worse from there (unless we spend plenty of maintenance resources keeping it clear.) 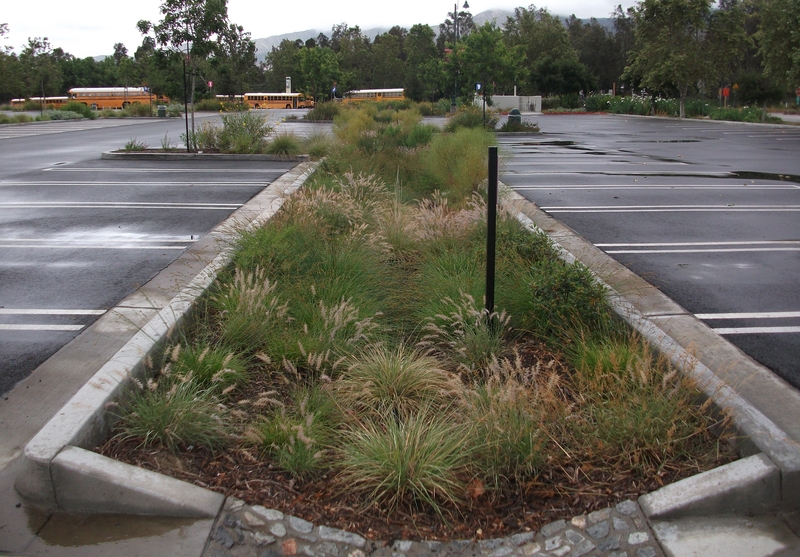 My preference would be to install more basic landscaped bio-swale on more streets, than to add excess thingamabobs and get to fewer streets. I am open to an explanation of what these do… I could be wrong. Also, this is a pilot, so it may be a good place to throw in the kitchen sink and monitor what works and what doesn’t… but it feels to me like someone wanted to spend more more money on gizmos, and less on green. – I didn’t see any trash grates, which I would have expected on the inlets. Grates would help to keep trash out of the bio-swales. – Overall the project is designed to keep the existing configuration of the street… which favors cars. If we are to achieve real sustainability in our cities, I think that we need to achieve more modal balance in our streets – which is to say that our streets should foster alternative modes of transportation, including bicycles, pedestrians, and transit. A greener design here could have included traffic calming features, such as bulbouts, which make it safer for pedestrians to cross the street, and which can make for even more permeable green space areas to filter and infiltrate rainwater. The city of Santa Monica has done traffic-calming bulbouts in other areas; similar features here could have made this project street even greener. Despite some aspects that I question, the Bicknell Avenue Street Greening Project is wonderful. As far as I know, it’s the first place in Southern California where we’ve actually broken the curb to allow rainwater to get out of the gutter and into the soil. It was definitely worth my time to bike and bus across town to check it out, and I am looking forward to observing it function during an actual rainstorm. Congratulations to the city of Santa Monica and all the folks involved in funding, designing and implementing the project! Another Photo of the Green Street! Like a proud parent, I want to show off pictures of “Las Trincheras” – the stepped terraces that harvest rainwater in my front yard. These are inspired by Brad Lancaster, the water harvestologist from Tucson Arizona, whose books include excellent instructions for creating simple gravity-fed earthworks that detain and infiltrate rainwater. I live at Los Angeles Eco-Village – an intentional community located in Koreatown in Los Angeles. The first terraces were begun as part of a hands-on urban permaculture course I taught here in the summer of 2008. Here’s a photo of what the area looked like in early June 2008. The sloped grassy surface ushered water off onto the sidewalk, and into the street. From there the water heads through a storm drain and into Ballona Creek and the Santa Monica Bay. We decided that we’d rather slow down these raindrops, and invite them to soak into the ground, where they can help sustain plants and trees. On a small scale, This prevents flooding and pollution and augments local groundwater supplies. Indirectly, to the extent that it can offset use of imported water that is pumped here at great cost, it also saves energy which helps curb global warming, resource wars, and more. The first step was to weed the site as thoroughly as possible. This takes a lot of time, but if you don’t do it you’ll get a lot of hard-to-pull weeds growing up throughout your terraces. Also prior to the worshop I obtained a stash of broken concrete, which we call “urbanite.” I had been gathering this from various construction projects I would bike past in my neighborhood, but, for this larger project, I did recruit a truck to get larger quantities. Most crews will have to pay to dispose this stuff, so they’ll give it to you for free, if you’ll take it off their hands. If they don’t want to give it to you, try coming by their site at a little after 5pm and you should be able to harvest it. I’ve found that the most useful pieces are those at least larger than a brick. In addition to the urbanite, we arranged for a truckload of chipped tree-trimmings to use as mulch. This is another resource that’s generally available for free, as tree-trimmers will pay to dispose of it. They’ll ususally drop it off, but our contacts will only drop off full truck loads. We have them dump it in the street, then we haul it off and use it for mulching paths, courtyards, etc. This photo shows the extent of the project completed at the ten-person workshop – it takes a while to weed and to set each level, so after a 1-day workshop (about half of which was actual building work), all we’d finished was one low terrace – as well as the stairs on the right. Thanks to my friend/neighbor and co-workshop leader Federico who took charge of constructing the stairs. You might notice that the stairs drain slightly to the left, into the beds and away from the cob lizard bench. As Lancaster’s book tells, one important component for successful rainwater harvesting is to keep these retaining walls level – the terrace follows the contour of the landscape. Level terraces spread water out laterally along the contour, instead of allowing it to run off downhill. Use a level (tool) to make sure – a nice 6′ foot level is best, but you can make do with smaller. The sidewalk at the bottom of the photo (actually permeable pavement from a city of Los Angeles pedestrianization project) is sloped to the left. The top of the terrace wall is level. The wall serves multiple purposes (permaculture principles call this “stacking functions”) – it serves as a retaining wall for the garden bed and is also just the right height for sitting on, so it also serves as a bench. I am happy to say that it sees plenty of use, especially during class breaks at the adult school at the end of the block. Here’s another picture of the trincheras today. One mistake that I made in building them was to add too much mulch to to the soil. It’s definitely very good to mulch on top of the soil – especially after young plants have become established. Mulch itself is a water harvesting feature – it acts like a kind of one-way valve for water. The water soaks into the soil through the mulch, but the mulch shades the soil which blocks the sun from drying it out. It’s difficult to get seeds to start in mulched areas (which is another good thing about mulch – it prevents weeds from getting started.) I wanted to get more organic matter into the soil, so we added compost – which is a great amendment, but we also added mulch into the soil. Don’t try this at home. As chunks of wood break down in the soil, the process fixes some nutrients. This makes some of the soil nutrients less available to plants. When I planted corn and beans, immediately after building the terraces, the plants turned a relatively pale yellowish green and their growth was stunted. I gave them compost tea and they yielded some, but, still, overall, they didn’t do as well as I expected. Over time, the wood does break down and releases the nutrients back into the soil. While doing all this, the bed actually grows quite a bit of mushrooms… perhaps I should have taken advantage of this and planted good edible fungi? Just lately we’ve had some of our first significant rains, and the greens, chard, strawberries, onions, mizuna, arrugula, and artichokes I’ve planted there seem to be fairly well. The morning after recent rains, the terraces were very much saturated with rainwater they’d absorbed. I also created this second group of terraces a couple weeks ago. I didn’t have enough broken concrete, so I used some cinder blocks that were lying around unused. I filled the blocks with soil and planted in them. I am hoping that the plants grow out nicely and soften the somewhat linear gray lines of the blocks. If creek freak readers are interested in reading about my scintilating gardening proclivities (as well as musings of other eco-village gardeners,) you may want to check out the Los Angeles Eco-Village Garden Blog, where I’ve cross posted this. Friends of the L.A. River fundraiser dinner – Saturday, February 6th 2010 at 5pm, Union Station. You are currently viewing the search results for permeable pavement.